The clinical provocative mechanism causing occupational asthma among operators at primary aluminium smelters is not known and has never earlier been tested. The symptoms of asthma show an inflammation in the mucous membranes that are on the inside of the respiratory passages. New data show that the irritation in respiratory organs or air pollution can by itself stimulate the immunity and induce changes in the inflammation. The aim of this project is to survey and study in detail the changes of inflammation, which break out in the respiratory mucous membranes among operators with occupational asthma in the potrooms. Bronchial biopsies and cleaning fluid from the lungs are examined by immune histochemical methods to estimate the cell compound, activity degree and signal substances. With our methods we hope to identify which part of the immunity that is central in the development of illness and in that way be able to document the causal relations. It is of great importance to prevent, treatment and prognosis to clarity whether the inflammation changes of occupational asthma differ from asthma of other causes. This was the first time that pathological changes in the airways of workers with potroom asthma were examined. The studies revealed that potroom asthma is associated with inflammatory changes in peripheral blood and bronchial mucosa, and that changes in non-smokers are similar to those previously reported in non-occupational and other occupational asthma. Smoking appeared to inhibit the asthma associated mucosal leukocyte accumulation in the asthmatic workers, suggesting an immunomodulating effect of smoking on the asthmatic reaction. The studies revealed further several novel phenotypic characteristics of bronchial T-cells in asthma, in particular regulatory T-cells and T-cell proliferation. The study is financed by the Norwegian Research Board, NHO - Conferderation of Norwegian Enterprise and AMS (Nordic Aluminium Industry's Secretariat for Health, Environment and Safety) and is a collaboration project between Professor Johny Kongerud, Department of Thoracic Medicine, Rikshospitalet, and Dr. med. Trond Halstensen, University of Oslo. The project Work related effects in respiratory regions was finalised by defence of the thesis for the medical doctor’s degree on June 13, 2008. 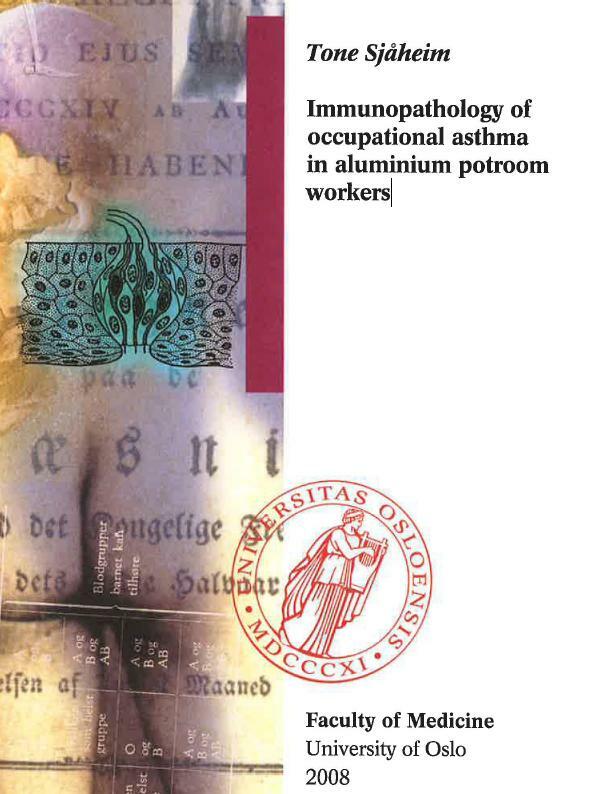 Immunopathology of occupational asthma in aluminium potroom workers.